Have you been bitten by the Trading Pin bug yet? I’ve always thought the pins at Disney looked cool but didn’t pay much attention to them until our last Disney World trip in January. JustaBXgirl asked me to buy her a blindbag pin as a treat and of course I agreed. When we came home she asked if she could get more. I acquiesced and ordered her some online. We went through her newly obtained collection and separated them into two piles. First pile was what she wanted to keep. Those stayed home. The second pile was to trade. Those would come with us for our Disney trip. Now that we separated the pins we had to discuss what it meant to trade. We had these discussions on an ongoing basis which might be why when it came time for the #ShopkinsSwapkins party JustaBXgirl was a professional trader. Even still that was with her friends. I can share with you that I was nervous about how this trading thing would go once at the park. 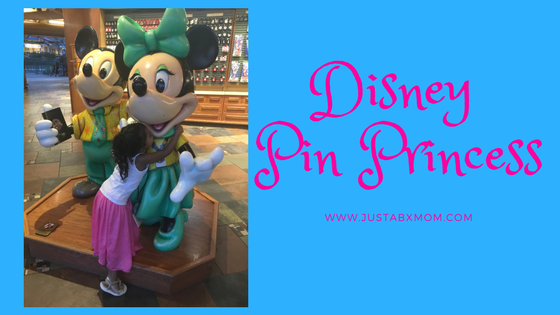 Of course we had some Disney magic and pixie dust sprinkled on us when it came to JustBXgirl’s first trade. We had just arrived at Disneyland and took photos when I noticed a little girl off to our side wearing her own lanyard covered with pins. I pointed her out the little girl to JustaBXgirl and asked if she wanted to try to trade. It just so happened that it was the little girl’s first trade as well!!! These two little princesses did AMAZING completely on their own. Us adults stood back gushing over how cute the girls were and only stepping in to help remove the pin backs. Both were happy with their trades and we took photos of the girls together to commemorate the trade! How cute are these pin princesses?! JustaBXgirl had so much fun trading that she had finished trading her pins well before we were ready to leave the park on the first day. She kept trading for pins that she wanted to keep up until the last pin. That one she kept trading until we came home. Once home she went through her new collection and has already created two new lanyards. One with pins to keep and one to trade. I might surprise her with a few new pins before our next trip. Overall we had a really nice time doing the trades. People are really sweet to littles and helped JustaBXgirl really embrace the trading concept. I was disappointed in the adults that replied “Oh, I don’t trade.” I get that some pins are just to showcase but it’s my belief that if you’re showcasing your pins at the park you should also have a few available for trades, especially when it’s with children. Do you or have you collected pins? What’s your favorite?